SNR 0104 is the remains of a supernova in the Small Magellanic Cloud, a nearby galaxy located about 190,000 light years away. Since it contains a large amount of iron, it was likely formed by an explosion of a white dwarf, not the collapse of a massive star. The asymmetrical shape is unusual for such a supernova and might be caused by jets in the explosion or clumps of nearby gas. 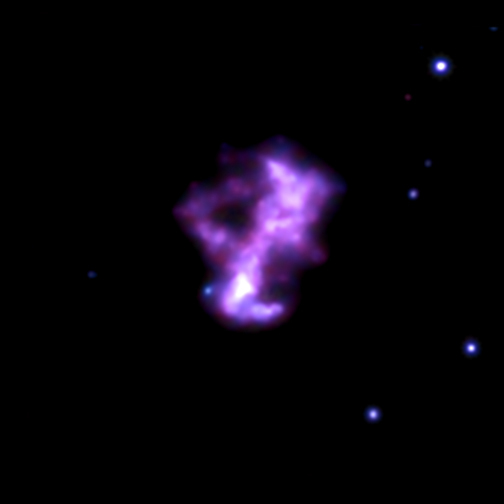 A new image from NASA's Chandra X-ray Observatory shows a supernova remnant with a different look. This object, known as SNR 0104-72.3 (SNR 0104 for short), is in the Small Magellanic Cloud, a small neighboring galaxy to the Milky Way. Astronomers think that SNR 0104 is the remains of a so-called Type Ia supernova caused by the thermonuclear explosion of a white dwarf. In this composite made of X-rays from Chandra shown in purple and infrared data from Spitzer shown in green and red, SNR 0104 looks unlike other likely Type Ia remnants found in our own Galaxy. 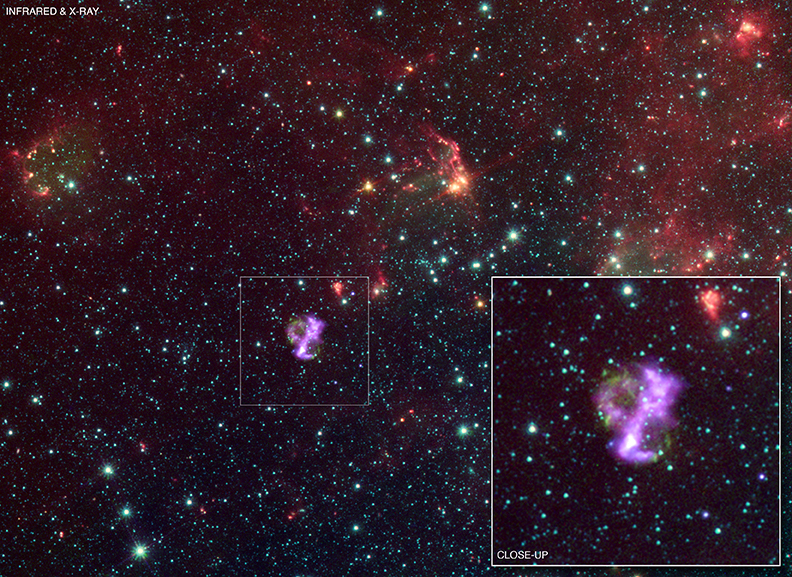 While objects such as the Kepler and Tycho supernova remnants appear circular, the shape of SNR 0104 in X-rays is not. Instead, the image is dominated by two bright lobes of emission (seen to the upper right and lower left). The large amount of iron in these lobes indicates that SNR 0104 was likely formed by a Type Ia supernova. One possible explanation for this structure is that the explosion of the white dwarf itself was strongly asymmetrical and produced two jets of iron. Another possibility is that the complicated environment seen in the image is responsible. The green shells on the left and right side of SNR 0104 correspond to surrounding material that has been swept up by the explosion. So, the unusual shape of the remnant might be caused by a lack of material to the north and south of the star to interrupt the outward path of the stellar debris. This explanation, however, is still in question and scientists hope more data from Chandra and other telescopes will help settle the debate. The presence of a nearby massive star and the shells of gas and dust seen in the wide-field view from Spitzer shows that SNR 0104 might be located within a star-forming region. This suggests that SNR 0104 may belong to a little-studied class of so-called "prompt" Type Ia supernovas caused by the demise of younger, more massive stars than average. Again, more data will be needed to test this theory. The Chandra website is a wonderful source, offering some additional information in their releases to explain each observation. Thank you very much for the exciting results. I want to say thank you for this. or some outflows from the binary system could have affected the surroundings. However, we have no direct information on the companion star's nature with the current X-ray data. The size of the SNR in N-S elongation (which are mostly Fe ejecta) is ~85 light years, assuming the distance of ~200000 ly to the host galaxy SMC. Did you mean "this supernova remnant" (rather than "this galaxy")? Assuming that you mean "supernova remnant", yes, there are some other metal species than Fe that are abundantly produced in the SN explosion, e.g., O, Ne, Mg, Si, S etc. Since Type Ia SNe are the major factory to produce Fe material (also Si, S, but not much O and Ne), Fe is usually a iconic element in Type Ia SNRs. In this SNR 0104, Fe is actually the most prominent element detected in X-rays. In contrast, O and Ne are typically the most abundant elements produced in "core-collapse (Types II,Ib/c)" SNRs. Our results point at a Type Ia SN for the origin of 0104. Thanks space tech science, thanks NASA for your powerful work. It is a beautiful picture. We must wait for more data about this source to complete answer this questions guys. Listen, you guys are the experts, so my apologies for proposing some explanation for the irregular supernova remnant, that may be completely absurd BUT is it at all possible that this could have been a multiple star system with a minimum of three stars in very close proximity to one another, close enough to have been annihilated along with the white dwarf supernova and whose gravity caused the distortion in the resulting debris. This is one governmental area where I have no problem with my tax dollars being spent. Are there any other heavy metal elements that may also play a role in contributing to the sgape of this galaxy? What is the size of the double jet? I'm so lucky have the chance to recognize abundant messages of the universe from this exciting wonderful good website. As usual, the picture was terrific. Can't wait for my grandson to see it. I've been cataloging all Chandra e-mail and photos for him in the hopes that he loves Astronomy as much as I. Could it be a function of dwarf angular momentum fast spinners confine debris better than e. g. slow spinners tidally locked to a closer bigger more massive companion star? Any info on the companion star accretion source?